"In regard to Bible versions many contemporary Christians are behaving like spoiled and rebellious children. They want a Bible version that pleases them no matter whether it pleases God or not. 'We want a Bible version in our own idiom,' they clamor. 'We want a Bible that talks to us in the same way in which we talk to our friends over the telephone. We want an informal God, no better educated than ourselves, with a limited vocabulary and a taste for modern slang.' And having thus registered their preference, they go their several ways. Some of them unite with the modernists in using the R.S.V. or N.E.B. Others deem the N.A.S.V. or the N.I.V. more evangelical. Still others opt for the T.E.V. or the Living Bible. But God is bigger than you are dear friend, and the Bible version which you must use is not a matter for you to decide according to your whims and prejudices. It has already been decided for you by the workings of God's special providence. If you ignore this providence and choose to adopt one of the modern versions, you will be taking the first step in the logic of unbelief. For the arguments which you must use to justify your choice are the same arguments which unbelievers use to justify theirs, the same method. If you adopt one of these modern versions, you must adopt the naturalistic New Testament textual criticism upon which it rests. In other words, naturalistic textual criticism regards the special, providential preservation of the Scriptures as of no importance for the study of the New Testament text. But if we concede this, then it follows that the infallible inspiration of the Scriptures is likewise unimportant. For why is it important that God should infallibly inspire the Scriptures, if it is not important that He should preserve them by His special providence? Where, oh where, dear brother or sister, did you ever get the idea that it is up to you to decide which Bible version you will receive as God's holy Word? As long as you harbour this false notion, you are little better than an unbeliever. As long as you cherish this erroneous opinion, you are entirely on your own. For you the Bible has no authority, only that which your rebellious reason deigns to give it. For you there is no comfort, no assurance of faith. Cast off, therefore, this carnal mind that leads to death! Put on the spiritual mind that leads to life and peace! Receive by faith the true Text of God's Holy Word, which has been preserved down through the ages by His special providence and now is found in the Masoretic Hebrew text, the Greek Textus Receptus, and the King James Version and other faithful translations." Below date to 330-350 A.D. 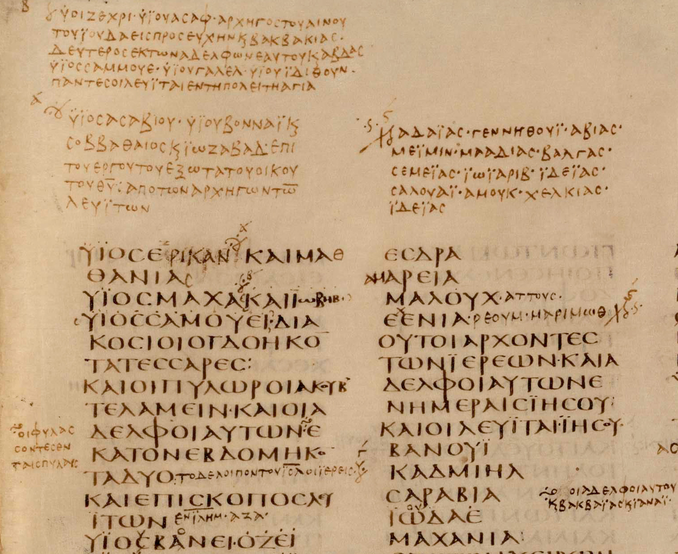 The entire well preserved Codex Sinaiticus consists of 346 1/2 folios, written in four columns. Of these 199 belong to the Old Testament and 147 1/2 to the New Testament. The extant New Testament of Codex Vaticanus contains the Gospels, Acts, the General Epistles, the Pauline Epistles and Hebrews (up to Hebrews 9:14). All of the other newer Bible versions, such as the NIV, NASB, etc. are based upon another manuscript family known as the Alexandrian Manuscript family which was put together by Origen of Alexandria, Egypt in about the 2nd century. Most scholars agree Origen was a heretic because of his denial of essential doctrines. In all, there are over 5,000 major changes between the Majority Text (KJV ) and the Minority Text (all other newer false bibles). 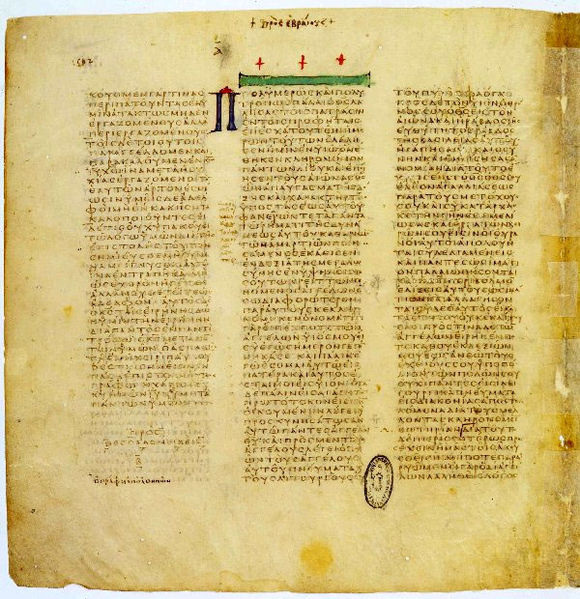 It is common knowledge that the Greek New Testament text produced by Westcott and Hort was based on the Alexandrian manuscripts Sinaticus and Vaticanus. This text was then used to produce the Revised Version 1881 and the American Standard Version 1901. Bible scholarship of the past 150 years has placed much attention on a very small number of manuscripts. While there are over 5000 known New Testament manuscripts, attention has been placed on less than ten. Of these, Codex Sinaiticus and Codex Vaticanus have been exalted as the “oldest and best” manuscripts. The oldest claim has been disproved elsewhere. This document will focus on the nature of these two favored manuscripts. 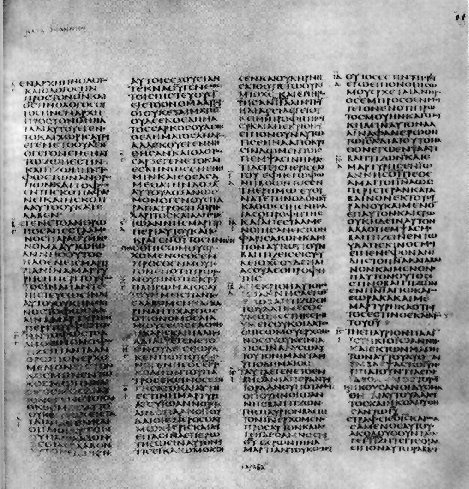 Sinaiticus has been recently made available to all on the internet by the Codex Sinaiticus Project, with the mainstream media and general Christians fawning over this “world's oldest Bible.” This manuscript, in conjunction with Codex Vaticanus, form the basis for most modern Bible translations. However, these two manuscripts differ substantially from the text of the bulk of the manuscripts. Thus, the public needs to know the truth about these manuscripts. Contrary to what has been taught in most seminaries, these two manuscripts are worthless, and hopelessly corrupt. Dean John Burgon, a highly respected Bible scholar of the mid to late 1800's, wrote of these manuscripts, “The impurity of the Texts exhibited by Codices B and Aleph [Vaticanus and Sinaiticus] is not a matter of opinion but a matter of fact.”1 These documents are both of dubious origin. It has been speculated by some scholars that one or both were produced by Eusebius of Caesarea on orders of Emperor Constantine2. If this is true, then these manuscripts are linked to Eusibus's teacher Origen of Alexandria, both known for interpreting Scripture allegorically as opposed to literally. Scholars have designated these manuscripts as Alexandrian, linking them with Alexandria, Egypt, the region responsible for early heresies such as Gnosticism and Arianism. Both are dated in the mid to late fourth century. The New Westminster Dictionary of the Bible concurs, “It should be noted, however, that there is no prominent Biblical MS. in which there occur such gross cases of misspelling, faulty grammar, and omission, as in B [Vaticanus].”5 Vaticanus omits Mark 16:9-20, yet there is a significant blank space here for these verses.6 Sinaiticus also lacks these verses, but has a blank space for them.7 These two manuscripts are the only Greek manuscripts that omit these verses! No other early manuscript of the Christian Bible has been so extensively corrected. A glance at the transcription will show just how common these corrections are. They are especially frequent in the Septuagint portion. They range in date from those made by the original scribes in the fourth century to ones made in the twelfth century. They range from the alteration of a single letter to the insertion of whole sentences. The figure below gives an example of Sinaiticus' many corrections. All of the other newer Bible versions, such as the NIV, NASB, etc. are based upon another manuscript family known as the Alexandrian Manuscript family which was put together by Origen of Alexandria, Egypt in about the 2nd century. Most scholars agree Origen was a heretic because of his denial of essential doctrines. In all, there are over 5,000 major changes between the Majority Text (KJV & Douay Reims) and the Minority Text (all other newer bibles). The two best renditions of the Bible that have had the least amount of change are the King James and the older versions of the Douay Reims, Catholic Bible. The original King James Bible is the Authorized Version of 1611 (AV). This Bible does a good job in translating the ancient Hebrew texts. The King James, Authorized Version is relatively free from bias and is widely accepted by English speaking Protestants. This manuscript family behind the KJV is called the Traditional or Majority text because over 99% of the manuscripts that have ever been found support and back this text. Scholars have discovered 5,255 pieces of manuscript evidence. Its been said that Of these, 5,210 of them support the Traditional text behind that of the KJV! That’s why it is called the MAJORITY text! That is 99%! Most important vis-à-vis credibility is that these manuscripts come from all over the known world of the day, not from any central location. And 99% agree with each other. The Textus Receptus (received text) (aka: "Byzantine Text") from which the King James Bible came can be traced clear back to Antioch, Syria, where the disciples were first called Christians and where Paul and Barnabas taught the word of God for a whole year (Acts 11:26). The most notable version support for the Byzantine text is in the Peshitta Syriac and the fourth century Gothic version. A second-century date for the Peshitta used to be advocated, but study of the Biblical quotations in the writings of Syrian Fathers Aphraates and Ephraem has demonstrated that neither of these leaders used the Peshitta, and so it must date from after their time, i.e., to the late fourth century or after. Erasmus gathered many of these documents on his travels himself. The text for these new bibles Hort and Wescott took from finds in Alexandria, Egypt, and from Rome . Hort clearly had a bias against the Textus Receptus, calling it "villainous" and "vile". Hort aggressively taught that the School at Antioch (associated with Lucian) had loosely translated the true text of Scripture in the second century A. D. This supposedly created an unreliable text of Scripture which became the Textus Receptus. This was called the Lucian Recension Theory. The Latin Vulgate Bible, translated by St. Jerome from the Septuagint Cannon (LXX) of the Old Testament, is considered the "official" Bible of the Catholic Church. Probably the most important figure in the renaissance of learning and religion was Erasmus. He traveled around Europe's great learning centers, such as Oxford, Cambridge, Paris, Rome and others. He left his mark in history as the editor of the first published Greek New Testament printed in 1516"
Barry Burton says: "The vast majority of Greek manuscripts agree together. They have been passed down thru the centuries by true Bible-believing Christians. In 1516 Erasmus compiled, edited, and printed the Greek 'Textus Receptus'. This is the text that the Protestants of the Reformation KNEW to be the Word of God (inerrant and infallible). The text Erasmus chose had an outstanding history in the Greek, the Syrian, and the Waldensian Churches (also termed "Syrian", "Antioch", or Koine text), and ... it constituted an irresistible argument for and proof of God's providence. The Old Testament has been faithfully preserved by the Jews in what is known as the Masoretic Text. There are few translation problems with the Old Testament. Now, the truth about Erasmus. The truth about Erasmus is that he was first a Roman Catholic monk who was later ordained and became a Roman Catholic priest, who opposed Luther and the Reformation, was offered by the Pope himself the high Roman Catholic church position of cardinal, refused to leave the Church of Rome and always freely submitted his judgments to the decisions of the Roman Church. Let's look in a 'modern' version of the Bible, at Luke 2:33.
" ... and his FATHER and mother were amazed at the things which were spoken of him" [i.e. of Jesus]. his father" was amazed at the things which were spoken of him?! The father of Jesus was NOT Joseph! Jesus' father was God! "And JOSEPH and his mother marveled at those things which were spoken of him". For a 'modern' version ( NIV, NASV, RSV etc.) to say Joseph was Jesus' father is blasphemy! "For the Son of man is come TO SAVE THAT WHICH WAS LOST." This one verse, which summarizes Jesus' entire mission to earth, is either ignored in 'new' versions; or it is put in brackets casting doubt on it! This verse contains a KEY piece of Christian doctrine. Turn to 1st Peter 4:1. In a 'modern' version it says: "... Christ suffered ..."
"... Christ suffered FOR US." Notice the last two words give the FULL meaning. Leaving out "for us" misses the point entirely! "in whom we have redemption ..."
"In whom we have redemption THROUGH HIS BLOOD ..."
With no shedding of blood -- there is NO remission of sins. Leaving out "the blood" misses a key point of doctrine (and leaves us in our sins). "... Our Father which art in heaven, Hallowed (Holy) be thy name. Thy kingdom come. Thy will be done, as in heaven, so in earth. Give us day by day our daily bread. And forgive us our sins; for we also forgive every one that is indebted to us. And lead us not into temptation; but deliver us from evil." "... Father, hallowed be Thy name. Thy Kingdom come. Give us each day our daily bread. And forgive us our sins, for we ourselves also forgive everyone who is indebted to us. And lead us not into temptation". This modern version states "Father" but then leaves out "... WHICH ART IN HEAVEN ...". You don't know who you are praying to, your Father in heaven, or to Satan! This modern version also leaves out "THY WILL BE DONE, AS IN HEAVEN, SO IN EARTH". By leaving out the fact that we are praying to our Father WHOSE WILL IS DONE IN HEAVEN, this 'modern' version is re-directing your prayer away from God and toward someone or something else (in another place). Look at it again. There is a major omission in the last half of verse 4. Verse 4 states: "And lead us not into temptation". But this verse then leaves out: "... BUT DELIVER US FROM EVIL ..."
The New Revised Standard Version, New World Translation and Revised English Bible take Isaiah 7:14 and discount the prophecy of Mary being a virgin by calling her a young woman. Romans 13:9: For this, Thou shalt not commit adultery, Thou shalt not kill, Thou shalt not steal, Thou shalt not bear false witness, Thou shalt not covet; and if there be any other commandment, it is briefly comprehended in this saying, namely, Thou shalt love thy neighbour as thyself. The phrase "thou shalt not bear false witness" is missing from the modern critical text. 6:13 And lead us not into temptation, but deliver us from evil: For thine is the kingdom, and the power, and the glory, for ever. Amen. 8:29 And, behold, they cried out, saying, What have we to do with thee, Jesus, thou Son of God? art thou come hither to torment us before the time? 9:13 But go ye and learn what that meaneth, I will have mercy, and not sacrifice: for I am not come to call the righteous, but sinners to repentance. 16:3 And in the morning, It will be foul weather to day: for the sky is red and lowring. O ye hypocrites, ye can discern the face of the sky; but can ye not discern the signs of the times? 17:21 Howbeit this kind goeth not out but by prayer and fasting. 18:11 For the Son of man is come to save that which was lost. The NASB teaches in John 5:29 that we are saved by doing ‘good deeds’ Rather than doing the one good thing of trusting Christ as Saviour! The NKJV teaches that it is ‘difficult’ to be saved in Matt. 7:14! The NIV teaches that Jesus SINNED when you read Mark 3:5 and Matthew 5:22! The NIV does away with Lucifer! There is no Lucifer in the NIV! Worse than that, the NIV declares that ‘the morning star’ is the that fell and was cut down and did weaken the nations, not Lucifer! When we read Revelation 22:16 we see that the Morning star is Jesus! Psalm 12:6-7 says, "The words of the LORD are pure words: as silver tried in a furnace of earth, purified seven times. Thou shalt keep them, O LORD, thou shalt preserve them from this generation for ever." The new versions have systematically removed Luke's witness to the ascension of Christ--and of course they have done away entirely with Mark's witness to the ascension, simply because these last twelve verses do not appear in those two corrupt manuscripts, the Vaticanus and Sinaiticus. Remember, these new bibles began to appear in the late 1800's. "In the year 1864, Lucifer together with a large number of demons will be unloosed from hell; they will put an end to faith little by little, even in those dedicated to GOD. They will blind them in such a way, that, unless they are blessed with a special grace, these people will take on the spirit of these angels of hell; several religious institutions will lose all faith and will lose many souls. Evil books will be abundant on earth and the spirits of darkness will spread everywhere a universal slackening in all that concerns the service of GOD. They will have great power over Nature: there will be churches built to serve these spirits. People will be transported from one place to another by these evil spirits, even priests, for they will not have been guided by the good spirit of the Gospel which is the spirit of humility, charity, and zeal for the glory of GOD. On occasions, the dead and the righteous will be brought back to life. " When they arrived in America in 1620, the most precious cargo the Pilgrims carried with them was the Bible. Have you ever wondered which version of the Bible they brought to America on the Mayflower? It was not the King James Version of 1611. It was an earlier version not sanctioned by the government – the 1599 Geneva Bible, a forgotten yet priceless treasure. The Geneva Bible, printed over 200 times between 1560 and 1644, was the most widely read and influential English Bible of the 16th and 17th centuries. The translation was the product of the best Protestant scholars of the day and became the Bible of choice for many of the greatest writers, thinkers, and historical figures of that time. Men such as Shakespeare, John Bunyan, and John Milton used the Geneva Bible, and it was reflected in their writings. During the English Civil War, Oliver Cromwell issued a pamphlet containing excerpts from the Geneva Bible to his troops. William Bradford cited the Geneva Bible in his book "Of Plymouth Plantation." The Geneva Bible is unique among all other Bibles. It was the first Bible to use chapters and numbered verses and became the most popular version of its time because of the extensive marginal notes. These notes, written by Reformation leaders such as John Calvin, John Knox, Miles Coverdale, William Whittingham, Anthony Gilby, and others, were included to explain and interpret the scriptures for the common people. Now 407 years after its original publication, this wonderful version of the Bible has been resurrected. Just as the King James Bible has a rich lineage of uncorrupted transmission through the ages, the modern versions also have a lineage. Their lineage is one of corruption, deletion, omission, addition, rejection and confusion. Modern versions are the fruit of arrogant scholarship which includes homosexuals who worked on the NIV. God never calls unbelievers to preach and neither would He call a sodomite to translate His Word. If your pastor rejects the pure lineage of the King James Bible and accepts the corrupt translations, then he is a proponent of modern scholarship which exalts the god of education above the God of the Bible. They are seriously deceived and are a danger to spiritual growth. scholar who will tell me what I want to hear. **Between 1933 and 1944 Rudolph Kittel had a leadership role in the “Forschungsabteilung Judenfrage” which was a Nazi organization and publication. What a heritage the NIV has, homosexuals and Nazis! Do you still think your NIV is ordained of God? If you do, then you are just plain stupid! (1) Jay Green’s translation is listed here because he, like the modern scholars, disputes whether Acts 8:37 & 1 John 5:7 are really in the text. 1 John 5:7-8 has been found in the Old Latin Vulgate (not Jerome’s) and early church lectionaries. Acts 8:37 is found in the Old Latin Vulgate Version, a Middle Egyptian Version and a Syriac Version. The booklet Bible Versions is spread over several pages, accessible through the Index below. Alternatively, you may download it as one file [230k]. A FREE printed copy of this booklet is now available. Famine of the Word of God! The New International Version: Is this the Word of God? New American Standard Version: Is this the Word of God? The New King James Version: Is this the Word of God? The Septuagint Is it inspired? The Apocrypha Is it inspired?